Great. The only reason I was holding onto my other-streaming-site subscription. This one's pretty good. All characters are likable--none of them are flat, exemplars of a stereotype, or one-dimensional. Kind of fanservice-y, but forgivable for those not into that kind of thing. Reminds me of when MMOs were just starting to get popular (UO/EverQuest/AC era), and people were just learning about building online communities as well as relationships, both romantic and platonic. I've seen more than a few fellow players make the same "dark mistake" that Rusian did... I think experiencing that once when playing MMOs as a single person is normal, so I'm glad they talked about it. Also, the last few episodes remind me of the good ol' days of Dark Age of Camelot siege warfare. Midgard 4 lyfe. It's an alright show, I watched it before on another platform (Funimation) before seeing CR add it here. The obvious oversexualization of the cover art threw me off and I put off watching it at first. It's pretty Meme-y, the romance actually goes somewhere, and the characters interact well with each other. Generically Good. Nothing stands out but it's not garbage. If you're looking to binge a show then this is as good as any, and all we can really ask for. This is a cute little show by people who've obviously played MMORPGs. and not too many girls fighting over the love of one doofus. The supporting characters seemed more real because of this. All in all, good job by the writing crew. I saw the news of this being added and I thought I'd check it out, get maybe 2 episodes in and drop it. So after binge watching the whole thing here I am giving a surprisingly positive review. As far as the characters are concerned, it's what you expect, the MCs main appeal is he's nice, the overly Moe girl, the tsundere, etc. etc. What actually really won me over was some of the dialogue. I don't know if this was actually what they were saying in Japanese or the person who subbed this went above and beyond, but I was shocked by the accurate use of MMO and gaming terms. This wasn't a "hello fellow youths" situation like I was fearing. Showing different sides of f2p games like whales just buying overpowered items and being useless when you take them away. Account hacking. etc. The show is actually pretty funny too. I especially liked this wasn't about every girl in the show wanting the D from the MC. Anyway, good show, highly recommend if you've ever played MMOs, especially F2P korean ones. Despite what you might have heard aside from like 2 blushes, there aren't any really signs of attraction between anyone, but our mains. While there are a lot of girls and only one guy, only one of those girls actually is in love with said guy. The premise is basically a group is formed to try and get the main girl to open up a bit more and understand the difference between reality and game. From this different events happen that have the usual bonding and growth. While nothing in this show is really new, what it does do is an adequate job at telling a story about a group of friends bonding over a game. This is a sweet, fluffy, jiggly (very jiggly) bit of content-free fun. Your brain will not be needed, as there isn't a lot of plot to speak of once you are introduced to the premise and all the characters are in play. The romance at the heart of the series isn't all that engaging; the arcs stemming from it are cute and amusing, but nothing that will write this series into the annals of romantic comedy history. No, where this series really shines are the scenes and arcs taking place in and around the online game all the characters play together. Our heroes deal with threats both in and outside the game and navigate the awkwardness of being a cluster of gamers while also trying to lead "normie" lives. The results aren't exactly unpredictable, but there's fun to be had. Otherwise, there is fanservice to the point of distraction, and the character designs for most of the female characters are ridiculously exaggerated. Beyond that, the characters themselves are fun, and while they play to obvious archetypes, they don't play them to the hilt. Which is another strength of this anime; it does an often amusing job of both hanging a lampshade on frequent anime cliches and then avoiding or subverting them. Not in all cases of course - this isn't that original - but I was pleasantly surprised by some of the in-jokes and self-awareness in play. Anyway. I've probably talked about this more than it deserves. It's a fun diversion, not a lot of substance, and doesn't require much of you. That can be both a good and bad thing. This is a great anime!! I am hoping for a season 2 to find out what happens next! The artwork is good. The story is good. The characters are good with plenty of room to grow if there is another season. 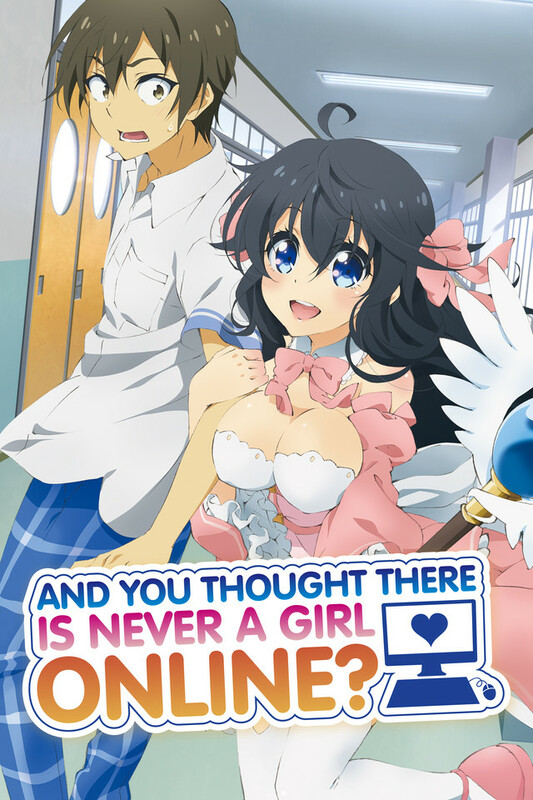 Does anyone know if they are going to make a second season? Obligatory Counterbalance to dummies that rated this show low. Cant find anything else to watch right now? bored? here ya go. Push through the MC being dense. its worth it. Characters are written well; story is like a 4/5. Worth the watch especially if you're in a slump. This series was amazing!! I just adored this anime so far. This show is about Hideki Nishimura play MMORPG called Legendary Age. He proposed to a girl while he was online. Then, he just realized that his teammates were all girl gamers, but they were in school. Once Hideki sees Ako in front of his school, he was very shocked that she is a real girl named Ako Tamaki. I just loved the characters especially Hideki and Ako. They loved playing net games on their computers. I even enjoyed this anime because it shows the MMORPGs they would able to play video games.